In a large pot of salted water cook the linguine according to packaging directions or al dente. In a large skillet melt 4 tablespoons of butter. Add the wine, garlic slivers, thyme and tomatoes. Season with salt and pepper. Season prawns with salt and pepper and add them to the skillet. Cook them until pink and almost done, about 5 minutes. 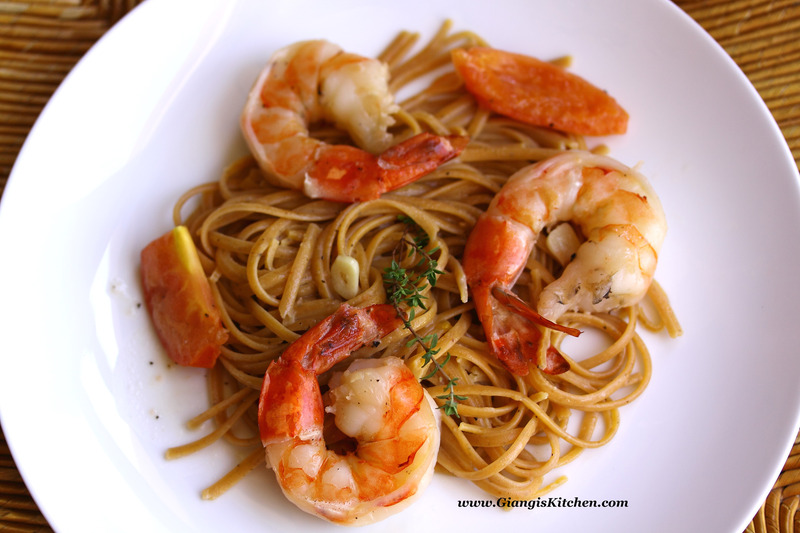 Drain pasta and add it to the large prawn wine sauce skillet. Add the remaining butter and continue cooking another 2 minutes. While the butter melts, stir gently while coating all the linguine. The Habanero linguine intrigued me. If you live in Arizona or any place in the South West, you know that habanero is hot, and I mean hot. Preparing a sauce to go along side was my challenge. Grocery on hand, I left the market with inspiration and excitement on preparing a new dish. During our travels this summer, I had this delightful pasta dish with wine, cream and garlic sauce. 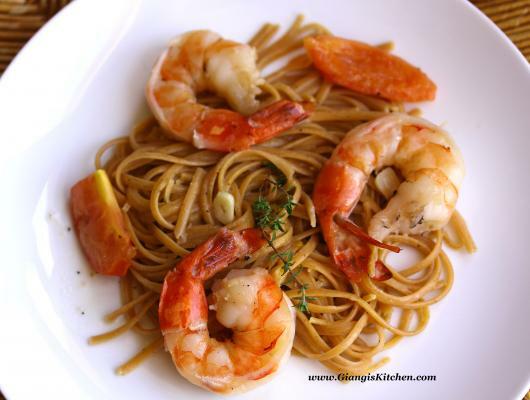 My challenge, therefore, was to replicate it while adding prawns that I just purchased from Personal Gourmet Foods,. The result was delightful. The heat from the habanero pasta blended well with the cream and wine while lowering the heat effect. The prawns, which almost require a wine sauce in my book, were infused perfectly with the sauce as well. Each bite had a great flavor between heat and light sauce. A definite re-make in our family as everyone enjoyed it very much.